The most successful method of oral chemolysis is with urease inhibitors. AHA is the most widely used irreversible inhibitor of bacterial urease. AHA has a high renal clearance, can penetrate the bacterial cell wall, and acts synergistically with several antibiotics. Although studies have demonstrated that AHA inhibition of bacterial urease decreases urinary alkalinity and ammonia levels even in the presence of infection, 20% of patients experience associated adverse effects. These include phlebitis, deep venous thrombosis, and hemolytic anemia. In addition, in patients with impaired renal function (serum creatinine level >2.5 mg/dL) has limited effectiveness and increased toxicity. Suppressive antibiotic therapy may prevent pyelonephritis and associated systemic infection and may help inhibit stone growth. Sterilization of the urine with antimicrobial treatment alone can partially dissolve some struvite stones. However, only a single case report exists in the literature of prolonged oral antibiotic (dicloxacillin) therapy alone resulting in complete resolution of an infection stone. Therefore, suppressive antibiotics should be viewed primarily as a means of inhibiting stone growth and as infection prophylaxis. Dietary manipulation with a low-phosphorus, low-calcium diet and aluminum hydroxide gel (in an attempt to limit substrate [ie, phosphate] for struvite stones) has had only modest success and carries a significant risk of calcium abnormalities (hypercalciuria) and possible aluminum toxicity. Other medical interventions, such as urinary acidification with oral ammonium chloride, have had limited long-term clinical utility. In the past, removal of large complex renal calculi required either anatrophic nephrolithotomy (bivalving the kidney on the lateral aspect) or pyelolithotomy (opening the renal pelvis). These are both major open operations with attendant morbidity. Moreover, these procedures did not always ensure complete stone removal, with the incidence rate of residual fragments ranging from 12-36%. The advent of minimally invasive modalities to treat renal stones revolutionized the approach to staghorn calculi. These include extracorporeal shockwave lithotripsy (SWL) and percutaneous nephrolithotomy (PNL). SWL was introduced in 1982 and is used to fragment urinary stones in a variety of locations without requiring an incision or instrumentation of the urinary tract. Struvite calculi are effectively broken by SWL because of the multiple laminations within the stones. However, even with excellent stone fragmentation by primary SWL, repeat therapy via SWL must be performed in 50% of patients because of a large stone burden. If multiple sessions are anticipated, the renal pelvis should be treated first. Real-time monitoring of stone fragmentation using fluoroscopy is important to target and shock all areas of the stone. If the renal infundibula are narrow, stone fragments that stem from SWL are unlikely to pass and remain in the calyces. Percutaneous nephrolithotomy (PNL) is the preferred surgical therapy in these cases. Large, wide infundibula that permit easy passage of fragments increase the stone-free rate and overall success of SWL treatment for staghorn calculi. PNL refers to the creation of a tract from the skin to the renal collecting system, thus permitting use of a nephroscope and instruments via this tract to fragment and remove stones. More recently, flexible ureteroscopes combined with small holmium laser fibers have allowed retrograde access to the kidney for stone destruction. PNL was developed and popularized in the 1980s with the proliferation of miniaturized instruments. Access to the kidney is obtained under ultrasound or fluoroscopic guidance, and the tract is typically dilated to 24-30F. Through this tract, a rigid nephroscope is introduced to visualize the stone and collecting system and to guide fragmentation. Energy sources for this purpose include ultrasonic, electrohydraulic, and pneumatic lithotrites and laser. The use of a flexible nephroscope allows examination of the entire kidney and helps ensure complete stone removal. Multiple PCN tracts may be used in cases of branched, complex staghorn calculi. After PNL, a PCN tube is placed to optimize urinary and fragment drainage. The first photo below illustrates the results of the patient shown in the second image. Right PNL was performed via a single lower-pole access during a single session, rendering the patient stone free. The left stone was later treated using SWL. Struvite and staghorn calculi. Plain abdominal radiograph of a 72-year-old woman. She underwent right percutaneous nephrolithotomy, with the path of renal access demonstrated by the remaining nephrostomy tube. She was rendered stone free in the single-session procedure. Struvite and staghorn calculi. 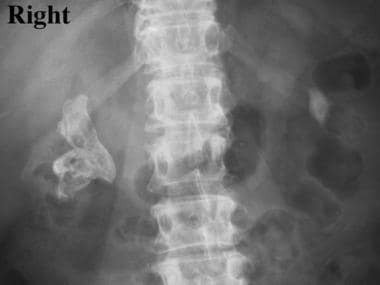 Plain abdominal radiograph demonstrating a right staghorn calculus and a smaller left renal pelvic stone. The patient is a 72-year-old woman. Technologic advances have resulted in instruments that can reach the kidney from the urethral meatus. Both laser and electrohydraulic ureteroscopic lithotripsy are possible and can significantly fragment staghorn calculi. 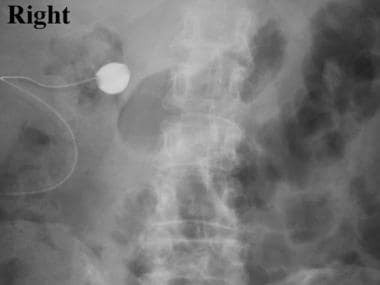 Case reports describe a synchronous bidirectional technique that combines percutaneous nephroscopy and retrograde intrarenal surgery to successfully treat complex, branched staghorn calculi, lessening the need for multiple flank punctures. As with SWL, the passage of a large stone burden requires an indwelling ureteral stent, and multiple treatments may be required. For both monotherapy SWL and retrograde ureteroscopic lithotripsy, rendering the patient stone free is difficult, especially in the setting of dilated collecting systems and dependent lower pole calyces. Although multiple surgical approaches to staghorn calculi are available, several principles must be kept in mind. First, complete removal of all stone material is the goal of any procedure. Simple debulking does not prevent future infections, stone formation, or impairment of renal function. Second, the patient should be counseled that multiple interventions may be required. If ureteroscopy or SWL is the primary treatment modality, the need for subsequent SWL, ureteroscopy, or PNL must be discussed. Use of combination therapy is a reasonable approach to ensure removal of all residual fragments. An example of this is the so-called sandwich technique, with initial PNL followed by SWL and then second-look PNL. Patient outcomes have been demonstrated to improve with increasing PNL experience. Third, the immediate use of adjunctive measures can be considered. Postoperative oral acetohydroxamic acid (AHA) and antibiotics may delay the regrowth of struvite stones. In addition, direct irrigation of the collecting system is possible through the nephrostomy tube after PNL. Lavage chemolysis for residual fragments consists of acidification of the urine with solutions such as Suby G or hemiacidrin (Renacidin). Although in vitro and in vivo data support some efficacy of direct acidification and ion exchange of stone calcium for magnesium, caution must be used when performing irrigation to ensure sterile urine, low intrarenal pressure, and normal serum magnesium levels. Hypermagnesemia (and associated toxicity) is more common in patients with compromised renal function. Patients rarely require additional procedures prior to removal of the stones; however, if the patient is uroseptic and has evidence of urinary obstruction (eg, hydronephrosis) or pyonephrosis, placement of a PCN tube or ureteral stent may be necessary. Only when the patient is clinically stable after adequate urinary drainage and administration of intravenous antibiotics should definitive surgical intervention for stone removal be performed. In performing PNL and open stone removal, be aware of the potential for an underlying anatomic abnormality such as ureteropelvic junction obstruction or ureteral stricture. Their role in staghorn stone formation should be considered, but the abnormality may not be best addressed at the same setting. After the stone has been removed, subsequent treatment can correct the defect. In analyzing outcomes of the treatment modalities, important considerations are (1) the probability of being stone free and (2) the probability of undergoing secondary unplanned procedures. Thus, careful assessment of the postoperative stone status is important. Plain abdominal radiography may help visualize large stone fragments after open surgery, PNL, and SWL. An advantage of PNL includes the ability to fill the collecting system with contrast and to perform antegrade nephrostography, typically 1-2 days after surgery if the patient remains afebrile. Evidence of significant residual stones or urinary obstruction may lead to second-look nephroscopy or maintenance of the nephrostomy tube, respectively. Most patients are discharged in 3 days after PNL, without the need for percutaneous renal drainage. Secondary SWL is usually indicated if a stone (or multiple stones >1 cm) remains in peripheral calyces. This can be performed during the same hospitalization 1-2 days after the initial PNL. After all treatment modalities, the patient should be closely monitored for signs of infection, renal dysfunction, and bleeding. Postoperative serum electrolyte evaluations, CBC counts, and creatinine studies should be performed. The patient should continue on the appropriate parenterally administered antibiotic. If an indwelling ureteral stent was placed prior to SWL, the patient should return for stent removal in 3-4 weeks. Patients should be evaluated in an outpatient setting in 3 weeks after any surgery for staghorn stones. Renal ultrasonography, abdominal radiography, and serum creatinine studies are usually performed. In addition, if a preoperative metabolic evaluation of stone disease (24-h urine collection) was not performed, conduct one postoperatively once the patient is no longer hospitalized and on a controlled diet. Patients should be exhibiting no symptoms, eating their regular diet, and following their usual lifestyle activities when such a study is performed. Infectious complications, including pyelonephritis and sepsis, may occur after either open or noninvasive (ie, SWL) treatment. Typically, infections occur early after PNL, but they may be delayed after SWL, when stone passage and obstruction occur. The incidence of significant blood loss and the need for transfusion after SWL is low, probably well below 0.1%. The authors' recent experience demonstrates a PNL-associated transfusion rate of less than 5%. Early recognition of bleeding after PNL is paramount. Venous bleeding can usually be managed by balloon tamponade or clamping of the PCN tube; arterial bleeding may necessitate renal arteriography and embolization (or rarely nephrectomy). However, kidney loss after percutaneous stone removal, although more common than after SWL, is rare (0.1%). Overall, the mortality rate associated with staghorn stone treatment is extremely low (SWL, 0.06%; PNL, 0.1%; PNL and SWL, 0.2%) and is typically related to cardiac dysfunction. Although significant morbidity is encountered more often with open surgery and PNL, SWL is associated with both planned and unplanned secondary interventions. Injury to adjacent organs, including the spleen, liver, colon, and lungs, has been reported with PNL. Knowledge of perirenal anatomy, prompt recognition, and appropriate intraoperative and perioperative management usually minimize associated morbidity. For example, placement of a chest tube effectively drains air and/or fluid from the pleural cavity. Supracostal renal access during PNL is associated with a greater likelihood of pulmonary complications. Perforation of the renal pelvis may occur during PNL. Adequate visualization, careful intracorporeal lithotripsy, and sufficient irrigation drainage help reduce this complication. Typically, it is identified immediately, with evidence of urothelial disruption or perinephric fat. Recognition of this complication is important so that the surgery can be terminated, minimizing extravasation of irrigation fluid and the potential for significant fluid absorption and spread of infection. Placement of the PCN tube is sufficient to ensure urinary drainage and healing of the urothelium. The nephrostomy tube is kept in place for 3-4 weeks to ensure healing, at which time nephrostography is performed and repeat nephroscopy can be considered for residual stone fragments. During PNL, irrigating fluid may also be absorbed through open venous sinuses; dilutional hyponatremia and hypothermia may result. Long-term complications of both open surgery and PNL include intrarenal stricture or stenosis of the collecting system. Infundibular stenosis was recently reported as a rare complication, typically within the first year after surgery, and was associated with more complex stones and PNL. Multiple measures of treatment outcomes are available for evaluation. At best, monotherapy SWL for struvite staghorn stones yields stone-free rates of 60%. Residual fragments remain in 22-70% of patients, and re-treatment is necessary in 32-88% of patients. In patients with a smaller stone burden (>500 mm2 surface area), stone-free rates may approach 90%. After monotherapy PNL, reported stone-free status is achieved in approximately 80% of patients. These outcomes are further improved in correlation to surgeon experience. Combining PNL with subsequent SWL yields stone-free rates comparable to those of PNL alone; this likely reflects the aggressiveness of the initial PNL and attempts to remove residual stones via flexible nephroscopy. While the goal of the physician is to ensure stone-free status, patients are interested in direct outcomes. Prevention of patient symptoms and associated stone-related morbidity, such as infection, are important means of assessing treatment success. Studies have demonstrated that, even in the presence of small stone fragments after SWL monotherapy and perioperative antibiotics for 2 weeks, 86% of patients were cured of persistent infection. Conversely, achieving stone-free status does not ensure resolution of persistent urinary infections. Important considerations in these patients include anatomic abnormalities, neurogenic bladder, indwelling catheters, or urinary diversion. Long-term freedom from bacteriuria is probably not possible in these situations. Potential deleterious effects of staghorn calculi and treatments for the stone have been a source of concern. However, studies have demonstrated the general safety of both SWL and PNL in the management of large stones, even with a solitary kidney and chronic renal insufficiency. Effects of SWL and PNL are minimal, with only slight decreases in renal function after intervention. Patients who progress to severe renal insufficiency associated with staghorn stones usually present initially with compromised renal function (serum creatinine level >3 mg/dL). Many aspects of struvite staghorn calculi require further study. Standardized classification of renal anatomy and staghorn calculi may improve staging of the stones. This will allow more accurate comparison of treatment modalities. Also, uniform methods of reporting treatment outcomes are needed. Determining which endpoints (eg, stone free, clearance of infection, preservation of renal function, resolution of symptoms) are most important is necessary. Elucidating some of these factors will help in selecting the appropriate surgical approach and goals of intervention. Continued technological advancements in minimally invasive instruments and increasing worldwide surgical PNL experience will continue to lessen the morbidity associated with staghorn calculi therapy. A better understanding of the etiology of infection staghorn stones may direct rational treatment. The potential role of microorganisms, such as nanobacteria, must be defined. In addition, development of more effective medical treatments may significantly alter management strategies. Urease inhibitors with less toxicity may have increased general utility. Also, drugs effective in acidification of the urine could halt stone formation and growth even in the presence of persistent infection. Diri A, Diri B. Management of staghorn renal stones. Ren Fail. 2018 Nov. 40 (1):357-362. [Medline]. [Full Text]. Gleeson MJ, Griffith DP. Infection Stones. Resnick MI, Pak CYC, eds. Urolithiasis: A Medical and Surgical Reference. Philadelphia, PA: Saunders; 1990. 134-36. Brown TR. On the Relation Between the Variety of Microorganisms and the Composition of Stone in Calculous Pyelonephritis. JAMA. 1901. 36:1394-7. Sumner JB. The Isolation and Crystallization of the Enzyme Urease. J Biol Chem. 1926. 69:435-41. Jongyotha K, Sriphrapradang C. Squamous Cell Carcinoma of the Renal Pelvis as a Result of Long-Standing Staghorn Calculi. Case Rep Oncol. 2015 Sep-Dec. 8 (3):399-404. [Medline]. [Full Text]. Priestley JT, Dunn JH. Branched renal calculi. J Urol. 1949 Feb. 61(2):194-203. [Medline]. Ansari MS, Gupta NP, Hemal AK, Dogra PN, Seth A, Aron M, et al. Spectrum of stone composition: structural analysis of 1050 upper urinary tract calculi from northern India. Int J Urol. 2005 Jan. 12(1):12-6. [Medline]. Tanthanuch M. Staghorn calculi in southern Thailand. J Med Assoc Thai. 2006 Dec. 89 (12):2086-90. [Medline]. Viprakasit DP, Sawyer MD, Herrell SD, Miller NL. Changing composition of staghorn calculi. J Urol. 2011 Dec. 186 (6):2285-90. [Medline]. [Guideline] Assimos D, Krambeck A, Miller NL, Monga M, Murad MH, Nelson CP, et al. Surgical Management of Stones: American Urological Association/Endourological Society Guideline, PART I. J Urol. 2016 Oct. 196 (4):1153-60. [Medline]. [Full Text]. [Guideline] Assimos D, Krambeck A, Miller NL, Monga M, Murad MH, Nelson CP, et al. Surgical Management of Stones: American Urological Association/Endourological Society Guideline, PART II. J Urol. 2016 Oct. 196 (4):1161-9. [Medline]. Lam HS, Lingeman JE, Russo R, Chua GT. Stone surface area determination techniques: a unifying concept of staghorn stone burden assessment. J Urol. 1992 Sep. 148(3 Pt 2):1026-9. [Medline]. Zilberman DE, Ferrandino MN, Preminger GM, Paulson EK, Lipkin ME, Boll DT. In vivo determination of urinary stone composition using dual energy computerized tomography with advanced post-acquisition processing. J Urol. 2010 Dec. 184(6):2354-9. [Medline]. Kulkarni NM, Eisner BH, Pinho DF, Joshi MC, Kambadakone AR, Sahani DV. Determination of renal stone composition in phantom and patients using single-source dual-energy computed tomography. J Comput Assist Tomogr. 2013 Jan. 37(1):37-45. [Medline]. [Guideline] Medical Management of Kidney Stones. American Urological Association. Available at https://www.auanet.org/education/guidelines/management-kidney-stones.cfm. March 2014; Accessed: December 24, 2018. Lewis GA, Schuster GA, Cooper RA. Dissolution of renal calculi with dicloxacillin. Urology. 1983 Oct. 22(4):401-3. [Medline]. Wang LP, Wong HY, Griffith DP. Treatment options in struvite stones. Urol Clin North Am. 1997 Feb. 24(1):149-62. [Medline]. Duty B, Okhunov Z, Smith A, Okeke Z. The debate over percutaneous nephrolithotomy positioning: a comprehensive review. J Urol. 2011 Jul. 186(1):20-5. [Medline]. Honey RJ, Wiesenthal JD, Ghiculete D, Pace S, Ray AA, Pace KT. Comparison of supracostal versus infracostal percutaneous nephrolithotomy using the novel prone-flexed patient position. J Endourol. 2011 Jun. 25(6):947-54. [Medline]. Chen L, Sha ML, Li D, Zhuo J, Jiang CY, Zhu YP, et al. Treatment for residual stones using flexible ureteroscopy and holmium laser lithotripsy after the management of complex calculi with single-tract percutaneous nephrolithotomy. Lasers Med Sci. 2017 Apr. 32 (3):649-654. [Medline]. Astroza G, Lipkin M, Neisius A, Preminger G, De Sio M, Sodha H, et al. Effect of supine vs prone position on outcomes of percutaneous nephrolithotomy in staghorn calculi: results from the Clinical Research Office of the Endourology Society Study. Urology. 2013 Dec. 82(6):1240-4. [Medline]. Blum KA, Parkhomenko E, Thai J, Tran T, Gupta M. A contemporary lower pole approach for complete staghorn calculi: outcomes and efficacy. World J Urol. 2018 Sep. 36 (9):1461-1467. [Medline]. Borofsky MS, Wollin DA, Reddy T, Shah O, Assimos DG, Lingeman JE. Salvage Percutaneous Nephrolithotomy: Analysis of Outcomes Following Initial Treatment Failure. J Urol. 2015 Nov 7. [Medline]. Al-Kohlany KM, Shokeir AA, Mosbah A, Mohsen T, Shoma AM, Eraky I, et al. Treatment of complete staghorn stones: a prospective randomized comparison of open surgery versus percutaneous nephrolithotomy. J Urol. 2005 Feb. 173(2):469-73. [Medline]. Meretyk S, Gofrit ON, Gafni O, Pode D, Shapiro A, Verstandig A, et al. Complete staghorn calculi: random prospective comparison between extracorporeal shock wave lithotripsy monotherapy and combined with percutaneous nephrostolithotomy. J Urol. 1997 Mar. 157(3):780-6. [Medline]. Gleason MJ, Griffith DP. Infection Stones. Resnick MI, Pak CY, eds. Urolithiasis: a Medical and Surgical Reference. Philadelphia, Pa: WB Saunders; 1990. 134-6. Griffith DP, Osborne CA. Infection (urease) stones. Miner Electrolyte Metab. 1987. 13(4):278-85. [Medline]. Lam HS, Lingeman JE, Mosbaugh PG, Steele RE, Knapp PM, Scott JW, et al. Evolution of the technique of combination therapy for staghorn calculi: a decreasing role for extracorporeal shock wave lithotripsy. J Urol. 1992 Sep. 148(3 Pt 2):1058-62. [Medline]. Lingeman JE, Lifshitz DA, Evan AP. Surgical management of urinary lithiasis. Walsh PC, Retik AB, Vaughan ED, Wein AJ, eds. Campbell's Urology. 8th ed. Philadelphia, Pa: WB Saunders; 2002. Vol 4: 3366-3370. McDougall EM, Liatsikos EN, Dinlenc CZ. Percutaneous approaches to the Upper Urinary Tract. Walsh PC, Retik AB, Vaughan ED, Wein AJ, eds. Campbell's Urology. 8th ed. Philadelphia, Pa: WB Saunders; 2002. Vol 4: 3320-40. Morey AF, Nitahara KS, McAninch JW. Modified anatrophic nephrolithotomy for management of staghorn calculi: is renal function preserved?. J Urol. 1999 Sep. 162(3 Pt 1):670-3. [Medline]. Suby HI, Albright F. Dissolution of Phosphatic Urinary Calculi by the Retrograde Introduction of a Citrate Solution Containing Magnesium. N Engl J Med. 1943. 228:81-91. Disclosure: Received honoraria from Bard Medical for speaking and teaching.